It’s hard to believe this recipe for Zucchini, Potato and Tomato Casserole was first posted way back in July of 2014 and yet it remains one of the most popular and shared recipes I have to date! Now updated and reformatted for Yummly!, I’d thought I’d share it with you again. 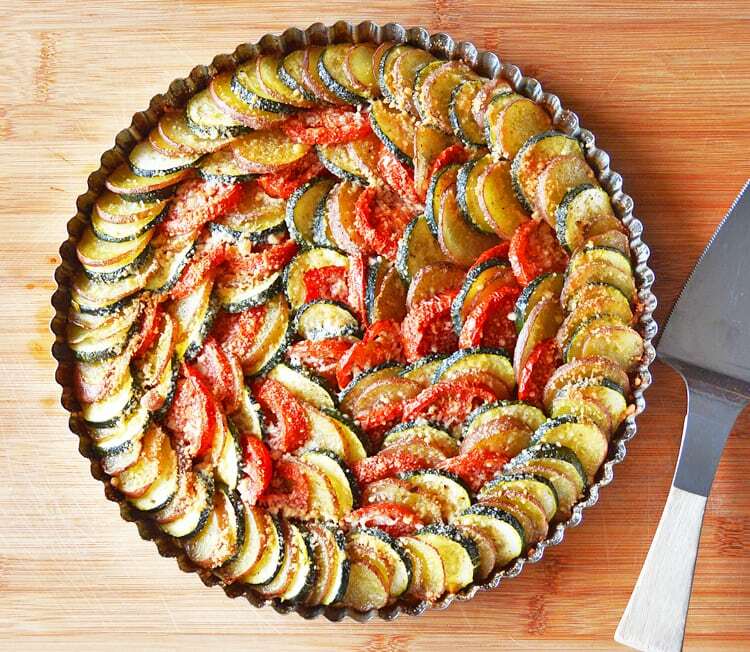 This Zucchini, Potato and Tomato Casserole is such an easy dish with an elegant presentation! Don’t be intimidated by the arranged nature, it took me less than 10 minutes to do this entire thing. 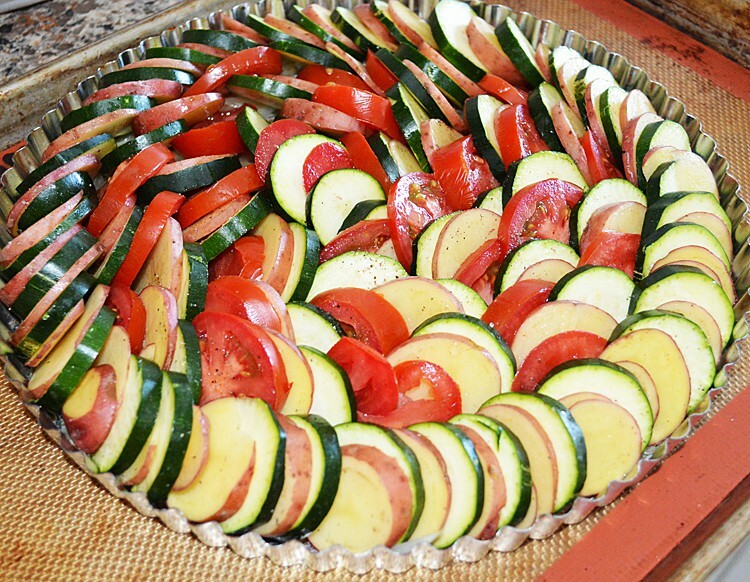 I started from the center in a spiral motion and just circled the edge with the remaining zucchini and potato slices. 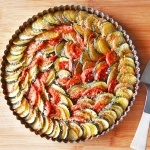 Caramelized onions line the bottom, while slices of zucchini, potato and tomato are arranged on top, overlapping slightly. We drizzled it with melted vegan margarine. This recipe was inspired and veganized from this recipe in Southern Living. NOTE: Keep in mind this is a crust-free casserole, so it’s low in calories but also is more of a spoonable dish rather than say, a tart you could slice. I’ve never tried it with a crust, but a few readers have asked. I am inclined to believe the moisture content of the veggies might compromise its integrity. If you try it, let me know! The casserole is baked for 30 minutes at 375 after which time I uncovered it and sprinkled with vegan parmesan cheese. I baked it another 35-40 minutes or until golden brown and tender. Let cool for 10 minutes prior to serving. The perfect side dish to any meal. Actually if you are watching your calorie intake, it’s also a great entree as well! At about 228 calories per serving, I love to enjoy it this way. Melt 1 Tbl of vegan margarine[/url] in a medium skillet over medium heat. Add onions and saute for 15-20 minutes until tender and caramelized. Spray a quiche pan or round baking dish with cooking spray. Spoon caramelized onions into the pan and spread evenly. 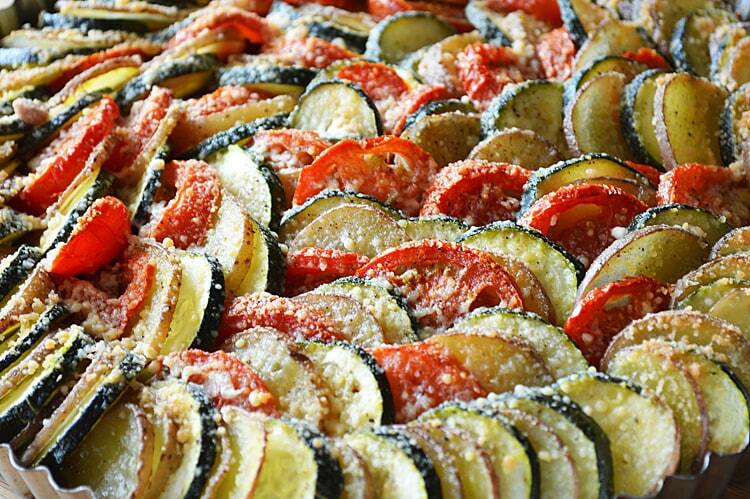 Toss potatoes, zucchini and tomato slices with salt and pepper. Arrange in a single layer over the onions, alternately and overlapping slightly. Drizzle with melted vegan margarine and cover with foil. Remove foil and sprinkle with vegan Parmesan. Do not cover and bake for an additional 35-40 minutes or until golden brown. Thank you so much Meredith 🙂 Let me know what you think if you decide to make it. Bought everything to make this, tonight. About how thick/thin did you slice the negetable? Sorr if it’s there and I missed it. I might use a mandolin if they need to be wafer thin. Thanks. I love all your recipes. Haven’t had a flop, yet. Thanks so much! I am glad you like the recipes 🙂 It’s nice to get some feedback. I sliced the veggies about 1/4″ thick. I’ll fix that in the recipe itself. So simple. Plus, it smells wonderful! I made this tonight for dinner. I added tofurkey polish sausage chopped up with the onions. My boyfriend ate almost the entire thing! This is the first recipe of yours I’ve tried. Will definitely be trying more! I am going to make this for a party later this week. Do you have an approximate size of the pan? VEGAN Margarine & Cheese? Sounds like a lot of Soy product….which BTW is NOT good for men who don’t wanna develop breasts. I think I will try this with alittle real butter, regular parmesan cheese and Italian seasoning. I can already tell it’ll taste great. Great idea. Do you know of anything that might be a good alternative to the onions? Made this last night for my non-vegan hubby and I – huge hit! Added some sliced Gardien meatballs with the onions but I think it would have been just as delicious without. With all of the zucchini I anticipate in my CSA boxes for the rest of the summer, I’m sure this recipe will be in regular rotation. I couldn’t make it as pretty as yours though! Thanks! This looks delicious!! Can you make it ahead of time (1-2 days)? Hi Aimee, made this last night! It was absolutely delicious:) I added mushrooms to the onions (YUM) and used coconut oil to caramelize the onions and mushrooms & olive oil on the rest! So, if you don’t like vegan margarine, there are other options:) Also, I made my own parmesan with nutritional yeast, sea salt and toasted sesame seeds!! Thanks so much for your inspiration:) Will definitely be making this again! There is something wrong with the recipe. I made it yesterday and it was all watery at the bottom. I followed the recipe exactly as it says. Zucchini needs to be salted and the excess water needs to be squeezed out from zucchini, and then it would be perfect. Any suggestions?? I just made this dish to go with green pea soup and my family loved it. Ithink not only looked beautiful it tasted delicious. I didn’t have vegan cheese so thanks to other comments I used ground up walnuts, nutritional yeast and a little bit of pink Himalayan salt Mixed together. This was so good, I wish I had done two casseroles instead of one! I also used mushrooms together with the onions, as someone else suggested above. Moreover I added some thyme, sage, and fresh parsley. Next time I’m gonna try some fennel too, I think it will be even more delicious! I used olive oil instead of margarine and it worked just fine. Made this tonight, easy , delicious and healthy. How many people does this recipe feed? I am having a dinner party for 20 and want to get the servings correct. Just stumbled upon this recipe as I had a zucchini and tomatoes to use up. So delicious!! Thank so much. Always a bonus when I see my vegan husband enjoying a dish I make. Thanks for offering this yummy recipe for those of us who are moving into a different style of eating.